New Jersey Assuming Leadership on Clean Energy, Climate Change NJ has a goal to reach 100% clean energy by 2050! In a short period of time since Governor Murphy took office, New Jersey has made significant strides in addressing the monumental challenge of climate change and in becoming a leader on clean, renewable energy. In January 2018, Governor Murphy signed an executive order taking steps to bring New Jersey back into the Regional Greenhouse Gas Initiative (RGGI), a cooperative effort among the States of Connecticut, Delaware, Maine, Maryland, Massachusetts, New Hampshire, New York, Rhode Island, and Vermont to cap and reduce power sector CO2 emissions. New Jersey had been a RGGI member until former Governor Christie removed our state from the program in 2011. In the first half of 2018, the state legislature passed and Governor Murphy signed the landmark clean energy law, making New Jersey among the leading states nationwide on renewable energy. The law requires that 50% of energy consumed in the state come from renewable sources by 2030, and sets ambitious targets for offshore wind, energy efficiency and storage. New Jersey Conservation Foundation played a key role in shaping the legislation with our partners and is now working to ensure it is implemented effectively, especially the new solar energy policies required. Governor Murphy also signed an executive order directing the New Jersey Board of Public Utilities (BPU) to create a new Energy Master Plan with a goal of 100% clean energy by 2050. New Jersey Conservation Foundation has been providing expert input to the BPU to help shape an effective plan that will transition New Jersey away from polluting fossil fuels to clean, well-sited, renewable energy, which is the goal of the Rethink Energy NJ campaign that we lead. 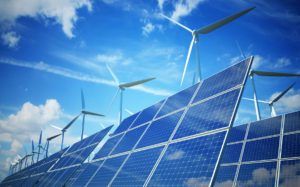 An essential step to achieve these aggressive clean energy goals is for the governor to jump-start New Jersey’s most promising new clean energy industry — offshore wind — which the BPU is moving ahead with through the nation’s largest offshore wind solicitation of 1,100 MW that will bring clean energy as well as new companies and jobs to NJ. Other urgent actions include taking steps to prevent the construction of the many proposed fracked gas pipelines, such as PennEast, and other fossil fuel infrastructure that would drive up emissions and impede progress toward reaching clean energy goals. On February 12, 2019, the U.S. Senate voted to permanently reauthorize the Land and Water Conservation Fund (LWCF) in a 92-8 vote, but the House of Representatives must also vote on this bill. Please urge your representative to permanently reauthorize and fully fund the LCWF. Click here to sign and personalize a letter to your Representative! New Jersey has a strong history of adopting comprehensive regional plans. Regional planning that incorporates environmental protection is critical to protecting the land and water supplies on which we depend. Other important benefits include stabilizing local property taxes, retaining the character of rural areas and established communities, and generally promoting growth in places where it is less environmentally damaging and more cost-effective to build, because of the presence of existing infrastructure like roads, sewers and public water systems. 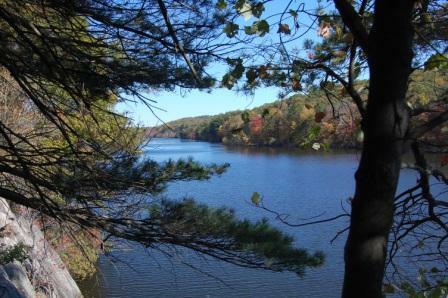 New Jersey Conservation Foundation has been integrally involved in the passage of many landmark New Jersey regional planning laws, including the Pinelands Protection Act, the Highlands Water Protection and Planning Act, the Delaware and Raritan Canal State Park law, and the State Planning Act. Constant vigilance is required to ensure these laws and their regional plans remain strong over time. The Highlands are part of the great sweep of the Appalachian Mountains that shadows the East Coast from Maine to Georgia. The Highlands Region extends from southeastern Pennsylvania through northwest New Jersey into New York and Connecticut. With forested ridges, pastoral farmland, and pure streams, lakes and reservoirs, the Highlands form a greenbelt surrounding the most populous metropolitan area in the US. The Highlands provide an essential source of drinking water, clean air, critical wildlife habitat, historic resources, recreational opportunities and scenic beauty for both its residents and the millions of people who live within an hour’s travel. New Jersey’s 2004 Highlands Water Protection and Planning Act passed by overwhelming majorities in the State legislature after two decades of focused citizen and governmental efforts to protect the New Jersey Highlands Region. The 860,000 acre Highlands, with only 17 percent of the land in the State, provides drinking water to 5.4 million – nearly two-thirds – of the State’s residents, who live in fifteen counties in northern, central and southern New Jersey. If you are either a Highlands water-drinker or a Highlands resident, there is good reason for you to become involved in the region’s protection. The New Jersey Highlands Coalition has an outreach program directed to Highlands water-receiving areas outside the region. To find out more visit the Highlands Coalition website. The Highlands Act affects 88 municipalities in parts of seven counties: Bergen, Passaic, Morris, Somerset, Hunterdon, Sussex and Warren. The Highlands Water Protection and Planning Council (Highlands Council) and the New Jersey Department of Environmental Protection (DEP) are both charged with implementing the Act. The DEP has rule-making authority over the Preservation Area, about half the region, much of which is preserved state and county lands. The Highlands Council completed the required Regional Master Plan (RMP) for the 88 municipalities in 2008. Conformance with the Plan is mandatory for the Preservation Area, but voluntary for the Planning Area. Since the Plan is based on scientific assessments of available water supply and septic capability in each watershed, its build-out scenario, along with required environmental ordinances, offers a blueprint for sustainable, capacity-based development for all Highlands municipalities in both the Preservation and Planning Areas. Implementation is achieved through municipal conformance with the Plan, which benefits substantially from the involvement and support of local residents. We periodically post action alerts on Highlands issues, so please sign up for our email alerts and stay tuned! NJ Conservation weighs in on 2018 Farm Bill Protecting the land that grows our food! We have begun to work on the 2018 Farm Bill with the Land Trust Alliance, the National Campaign for Sustainable Agriculture and other organizations to ensure robust funding for Farm Bill conservation and organic agriculture programs. New Jersey as a whole benefits enormously from these programs, including the Agricultural Land Easement program (ALE), which requires natural resource protections, especially soil protections so that the agricultural soils of today will be available to grow food tomorrow. Conservation program funding is likely to be reduced in the next Farm Bill and a greater emphasis placed on agricultural industry priorities due to the current climate in Congress and the Trump Administration. We are advocating with our partners for $500 million per year for ALE. Through our farmland preservation work, NJ Conservation is working toward a day when an abundance of locally grown New Jersey food, produced in a healthy, environmentally sustainable manner, will be available to feed the region. As part of that vision, large concentrations of preserved farmland will not only support the local food system, but will also protect the state’s water supply and wildlife habitat, combat climate change by sequestering carbon and connect with other preserved lands – parks, trails, and natural areas – as part of an interconnected system of public and private open space, with all of the benefits associated with preserved, open land. And while we support clean renewable energy sources, we are working to ensure that these sources don’t come at the cost of our most productive farmland. On November 7, 2017, New Jersey voters overwhelmingly passed the statewide ballot measure dedicating all funds from Natural Resource Damages settlements to the protection and restoration of natural resources. These funds have historically been used in part to preserve important lands, and NJ Conservation Foundation projects have received some of those funds, but a portion of the money has repeatedly been shifted to plug holes in the State operating budget. Passage of Question 2 this year – which had the support of nearly 70% of voters – will ensure that all funds resulting from settlements with polluters will be dedicated to environmental protection and restoration. Following extensive discussions and litigation over a proposed high-rise on the cliffs, LG Electronics USA, New Jersey Conservation Foundation and a number of parties interested in LG’s new North American headquarters in New Jersey reached a “win-win” solution. The new building design will create a world-class, sustainably designed building to the benefit of LG, the town of Englewood Cliffs and the state of New Jersey, while protecting the iconic vistas and integrity of the Palisades Park, a National Natural and Historic Landmark. LG reached the mutually beneficial settlement with Scenic Hudson, the New Jersey State Federation of Women’s Clubs, the Natural Resources Defense Council, New Jersey Conservation Foundation and New York-New Jersey Trail Conference. 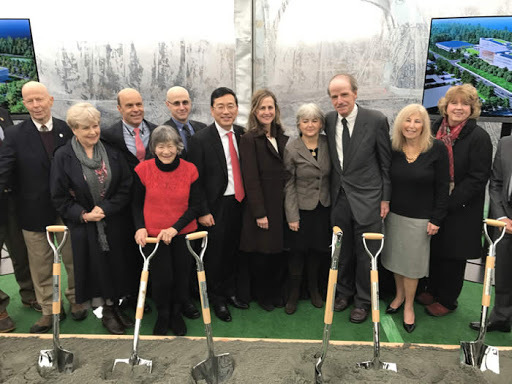 Laurance Rockefeller (third from right); Michele Byers and Alison Mitchell, New Jersey Conservation Foundation; and William Cho, LG Electronics, join conservation partners at the groundbreaking for LG North American headquarters. The new building design, reflecting compromises by all the parties, calls for a five-story north wing just shy of 70 feet in height and a three-story south wing, protecting the scenic views of the Palisades. LG will implement landscape, lighting and other design features to further reduce visual impacts, while retaining the scale of the complex as home for LG’s growing U.S. business. 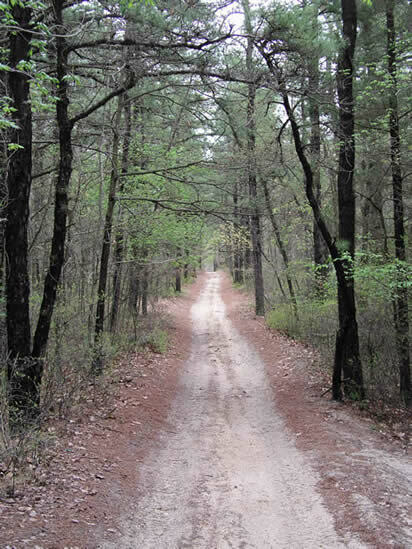 In 2017, the DEP pulled back from its plan to curb harmful off-road vehicle traffic in Wharton State Forest. However, we worked with the Pinelands Preservation Alliance and succeeded in urging the Pinelands Commission to adopt a motorized access map for all of Wharton. We are advocating that the DEP, under the Murphy Administration, enforce this new regulation and expand the designation of appropriate motorized access routes to all public lands in the Pine Barrens. Uphold the recently-developed policy of prohibiting the use of “single-track” forest trails for Enduro-type dirt bike motorcycle races on state lands. Single-track trails scar the landscape and are constantly re-used without permits, causing significant harm to natural resources. Recent actions at Brendan Byrne State Forest indicate that the single-track trail prohibition is not being followed. At 125,000 acres, Wharton State Forest in the Pine Barrens is by far the largest state-owned forest in New Jersey. 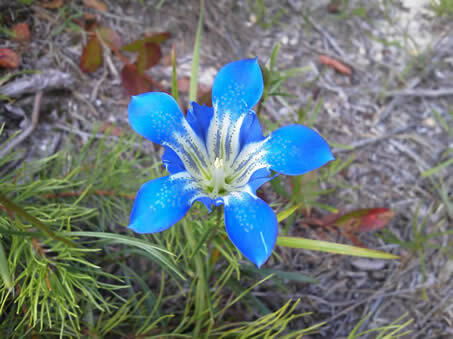 This remarkably diverse forest is home to many rare plants, threatened and endangered species and historic sites, including some 300 bird species, nearly 60 reptile and amphibian species, and more than 90 fish species. Forty-three of these animals are listed by the state as threatened or endangered, including bobcats, timber rattlesnakes and red-headed woodpeckers. Since Wharton was purchased in the mid-1950s, motorized vehicles have been allowed to travel its network of sandy roads to tour the quiet of the forest’s interior, visit historic ghost towns and put in a canoe. In recent years the damage to habitats and roads within the state forest has greatly accelerated as people in motorized vehicles have deliberately torn up fragile wetlands creating deep and dangerous puddles, destroying habitats, and making access for other users almost impossible. The damage at Wharton State Forest has also hindered fire suppression efforts, and search and rescue, due to damaged roadways. Enforcement of illegal off-road activities has been extremely difficult without a map clearly designating roads where motorized vehicle use is permitted and delineating those areas that are strictly prohibited. 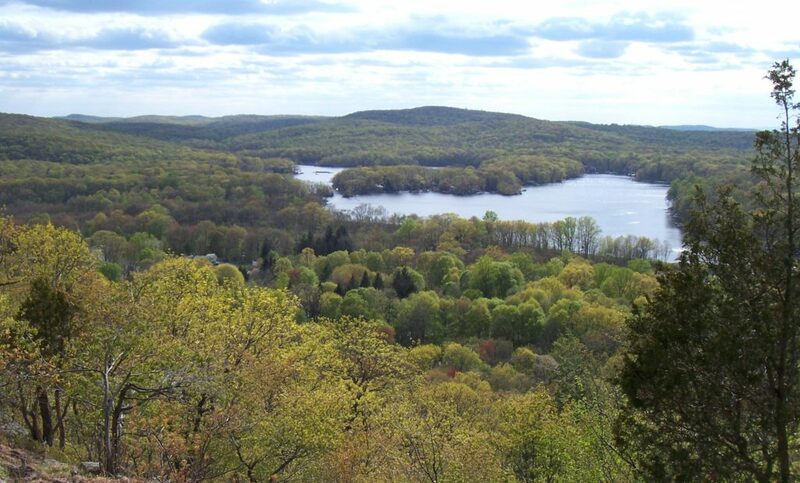 New Jersey needs a comprehensive regional vision and plan for its public forestlands to identify and designate ecologically sensitive areas and mature forests as natural areas and ensure that forest stewardship and management activities would avoid Natural Heritage Priority Sites. Such a plan will also ensure the conservation of rare forest interior species, the protection of scenic viewsheds, historic and archaeological resources, and the highly-valued passive recreational opportunities expected by the public on Green Acres-funded public lands. One-third of the plant species native to New Jersey are now considered rare, most are declining, and the public resources devoted to the conservation and management of the natural communities that support these species have been steadily shrinking. The NJDEP Office of Natural Lands Management and the Natural Heritage Program need funding in order to protect these public trust resources. Determine and prioritize key public land areas (those generally lacking in pre-existing data), which require rare plant surveys. Develop collaborations with non-profit community and funding sources such as Natural Resource Damages funds to conduct rare plant surveys. Determine boundaries of new and/or expansion of Natural Heritage Priority Sites and State Natural Areas. Ensure that forest management, including logging, is only used as part of comprehensive planning which would ensure the protection of rare plant and animal habitats and other sensitive ecological features. The NJDEP and non-profit community have been striving to acquire and preserve parcels with significant conservation and recreation values for decades. Examples include the “Holly Farm” in Millville, the Conrail ROW through Wharton State Forest and other additions to various state parks, forests and wildlife management areas and natural areas. It is critical that these high priority acquisitions are fully funded and move forward quickly. Develop full funding for land acquisition in all settings, from urban to rural. Additional protected parkland will be required to meet the needs of both natural resource protection and recreation as New Jersey nears buildout in the next few decades. A harmful concept, specifically that “we already have more public land than we can manage,” has crept into policy decisions in the last decade, when actually most lands do not require active management to protect natural resources, and the pace of protecting additional lands must continue if we are to provide opportunities for future resilience in the face of climate change and our ever-shrinking natural resource base. Strengthen the Green Acres diversion rules that apply to county, municipal, and non-profit open space, and strengthen weak and outdated State House Commission requirements for diversions of state parkland. Restore habitat at the 12-year-old, 65-acre outstanding wetlands violation at Whitesbog, within Brendan Byrne State Forest. In combination with NJ Department of Agriculture Phillip Alampi Beneficial Insect Laboratory and NJDEP Natural Resource Damages funds, investigate means of attaining biological control for our state’s three most disastrous invasive plant species: urban floodplain (Japanese Knotweed), coastal wetlands (Phragmites) and forests (Japanese Stiltgrass). Harmful agricultural chemicals, especially neo-nicotinamide coated seeds, are wreaking havoc with pollinators, key insect populations and the food chain in natural environments. The New Jersey Natural Lands Trust has instituted a policy to end the use of neo-nicotinamide seeds on lands leased to farmers, whereas NJ Division of Fish and Wildlife has been able to place limits on harmful farming practices on public land. Statewide policies should be implemented to ban neo-nicotinamide coated seeds and phase-out Roundup Ready crops and sod farms on all leased public trust parklands owned by the NJDEP. New Jersey currently has over 1,500 miles of existing natural gas pipelines with more than enough capacity to supply our residents, even in the coldest weather. But big energy companies are proposing to build a host of new pipelines, compressor stations and gas-fired power plants through the state. The PennEast pipeline is proposed to carry fracked shale gas from northeastern Pennsylvania across the Delaware River and into New Jersey’s Hunterdon and Mercer counties. The PennEast pipeline would cut through over 4,300 acres of preserved farmlands and open space and cross 38 of our highest quality streams that drain into the Delaware River and D&R Canal, which millions of people rely on for drinking water. There is no public need for the pipeline now, or in the future. In fact, the proposed PennEast pipeline would displace gas in existing pipelines in order for the companies behind PennEast, including New Jersey Resources and South Jersey Industries, to earn a guaranteed 14% rate of return for 15 years. The $1 billion cost of building the pipeline would fall on the backs of consumers and raise the costs of natural gas for ratepayers! That’s why the New Jersey Rate Counsel called in ‘unfair to ratepayers’ and like ‘winning the lottery’ for the companies. 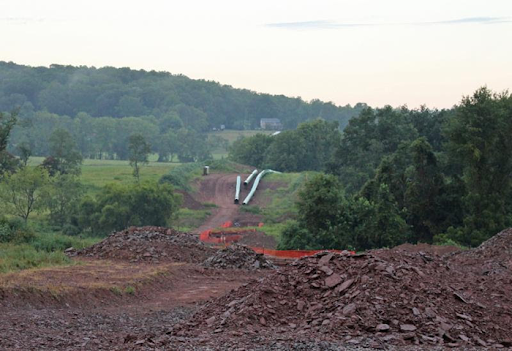 Federal Energy Regulatory Commission (FERC) conditional approval means that the private companies behind the PennEast pipeline can seize land from private homeowners, towns, and land trusts such as ours for the pipeline construction using eminent domain. State Attorney General Gurbir Grewel is challenging the court decision to grant PennEast the right to seize over 40 lands preserved by the state with taxpayer dollars. That is why every single town and county along the proposed pipeline route oppose it as well as Congressman Tom Malinowski, Congresswoman Bonnie Watson Coleman, State Senator Kip Bateman, State Senator Shirley Turner, and many others. So do the vast majority of the impacted homeowners. In spite of all of these findings, FERC gave conditional approval to the proposed 120-mile PennEast pipeline. While that may sound like the end of the story, it is not. This pipeline can be stopped! The project still needs permits from New Jersey Department of Environmental Protection (NJDEP) and other agencies. Why is NJDEP involved? Because this state agency oversees and enforces water quality and wetlands protections under the federal Clean Water Act, and they must determine the pipeline’s impacts using far more stringent standards. Since the PennEast pipeline would cross 38 pristine “Category 1” streams, the state’s highest water quality ranking, this is important. These streams have some of the purest water in the state and the pipeline would cause irreparable harm to these Delaware River tributaries. In addition, independent scientists warn that pipeline construction would increase the risk of arsenic — a toxin naturally present in the region’s bedrock — contaminating drinking water supplies! The pipeline must also receive approval from the Delaware River Basin Commission, which can use its broad, independent authority to protect water supply and quality in the Delaware River and its tributaries. For more information, visit RethinkEnergyNJ.org, our campaign to stop unneeded, polluting pipelines, and transition New Jersey to clean, renewable energy. TAKE ACTION! While FERC got it wrong, New Jersey can get it right. Contact Governor Murphy to thank him for his Administration’s efforts to defend state lands from seizure by PennEast, and to use the state’s full authority to protect New Jersey waters and wetlands from PennEast’s unneeded, dirty, and dangerous pipeline.